“Don’t compare your insides to someone else’s outside.” I first heard this quote years ago, well before the rise of social media. Now, more than ever, it speaks volumes to me. Worse yet, the woman in question never knows that she was ever the topic of conversation. Before you feel too badly for her, understand that she has been texting her friend all day about a mom in their son’s class who she describes as the cheapest person she has ever met. It should be no wonder that women judge themselves just as harshly. When we scroll through social media and see photos of a bouquet of flowers, we compare: When was the last time my husband brought me flowers? When we scroll through social media and see photos of a block party, we compare: Why isn’t my neighborhood that cool? When we scroll through social media and see a mom rocking a bikini, we compare: Why can’t I look that good? What if I told you that the woman who took a photo of her roses is on the brink of a separation? Or, if you realized that half the women in that neighborhood block party photo dislike one another. And in that bikini photo, let’s just say that your friend did more than a little re-touching. Social media gives us little authentic insight into what’s really happening in others’ lives. It’s no coincidence that it’s called media. It’s a story, the one we edit and choose to put out there. So if you see my photos from the Metropolitan Museum of Art, you would never know that my daughter had a major tantrum on the floor and the security guard stared her down. In my Hot Air festival balloon photos, you didn’t see that the balloons never actually launched. And in the first day’s challenge when my kids and I played board games, you had no idea that I threatened to donate those same games to charity because they refused to put them away. The next time you try to compare yourself to someone, realize that you are comparing fiction to reality. Reality doesn’t have filters. Reality doesn’t always get likes. Are you ready for the final challenge? We’ve made it. 30 challenges in 30 days. Here it is . . .
Every so often, we all need to pause and relect. Now that this challenge has ended, I’m going to really think hard about this challenge and how it changed me and my children over the last month. I’m sure I’ll need to repeat this challenge again and maybe tweak it along the way. We get so busy in our lives that we never find the time to self-assess: What are we doing that’s working? What do we need to change? Why is this happening? Most of these challenges were inspired by my own need to do exactly that. Every day is a challenge. 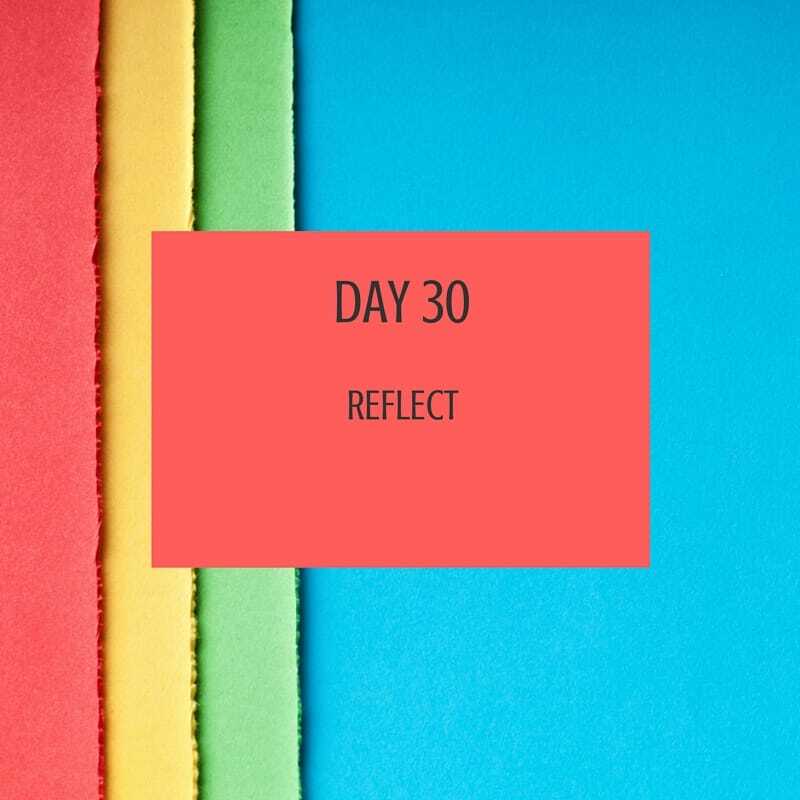 If you had to create your own 30-day-challenge, what specific goals would you include?